There’s just something endearing about animals with big heads and little bodies. 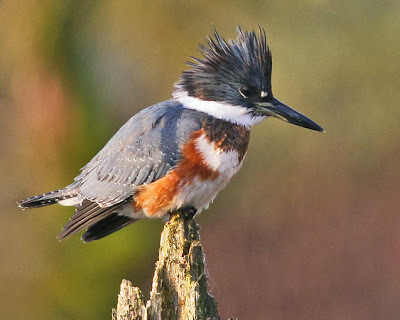 It might be one of the reason we own pugs… but it’s also the reason why we love the Belted Kingfisher, our October bird in our 12 Months of Birding at the Inn series for 2013. The Belted Kingfisher is one of those birds that you might hear more than you see. It has a dramatic, rattle sounding call, which can be quite loud. When you do see a Belted Kingfisher, the first thing you may notice is its head — top half blue with a bedhead-looking crest, bottom half white. Its head is disproportionately large compared to its little blue and white body, thanks in part to its long, thick, pointed bill. Female kingfishers are identifiable by the rust-brown band across their chests. Belted Kingfishers are listed as year-round residents at the Inn on Mill Creek, a site on the North Carolina Birding Trail, Mountains Region. As mentioned above, we hear them much more often than we see them, so when we do lay eyes on one, it’s very special. Since they eat aquatic prey, our kingfishers are most often seen perched on branches by the pond or flying back and forth across the water like they’re on patrol, defending their territory. Female Belted Kingfishers are more brightly colored than the males, which is rare for birds. Belted Kingfisher dads and moms take turns building their nest, digging a burrow on the bank of a pond or stream and making sure it slopes upward so rainwater doesn’t collect inside. The Belted Kingfisher dives into the water to catch its prey, with its eyes closed. Scientists are able to study what Belted Kingfishers eat because adult kingfishers regurgitate fish skeletons and invertebrate shells. However, young kingfishers are able to digest bones and shells — their stomach chemistry changes as they get older.